Canada's Gabrielle Daleman finished 11th on Friday at the world figure skating championships. The 21-year-old from Newmarket, Ont., who has missed time the past two years while dealing with mental-health issues, was proud of her performance. Wenjing Sui and Cong Han of China won the free skate to claim the gold medal in pairs at the figure skating world championships on Thursday. Canada’s Kirsten Moore-Towers and Michael Marinaro are fifth after the pairs short program on Wednesday at the world figure skating championships. Nam Nguyen, Alaine Chartrand and Kirsten Moore-Towers and Michael Marinaro all have bad-luck stories they'd like to rewrite at this week's world figure skating championships. Madison Chock and Evan Bates of the United States won the ice dancing competition at the Four Continents Figure Skating Championships. Canadians filled the rest of the podium as Kaitlyn Weaver and Andrew Poje finished second and Piper Gilles and Paul Poirier were third. Kaitlyn Weaver and Andrew Poje of Waterloo, Ont., took the silver and Piper Gilles and Paul Poirier of Toronto followed for the bronze in ice dancing on Sunday to conclude the ISU Four Continents figure skating competition. China's Wenjing Sui and Cong Han edged Canada's Kirsten Moore-Towers and Michael Marinaro by six hundredths of a point to win the pairs competition at the Four Continents Figure Skating Championships. Canadian figure skating star Tessa Virtue is using her voice to support female empowerment in sport, working with sportswear manufacturer adidas in the She Breaks Barriers campaign. Kirsten Moore-Towers and Michael Marinaro of Canada lead after the pairs short program at the Four Continents Figure Skating Championships. Kaitlyn Weaver and Andrew Poje, who took bronze at last year's World championships, are third in the ice dancing competition. Can Chen, Liu lead an American skating rebound? The present and future of American figure skating were on display at last week's national championships. Nathan Chen lived up to his own impressive standard at the U.S. Figure Skating Championships on Sunday, wrapping up his third consecutive national title with a sensational free skate. Nathan Chen took the lead at the U.S. Figure Skating Championships with a dazzling short program Saturday and is in great position to win a third straight national title. France's Gabriella Papadakis and Guillaume Cizeron closed in on a fifth consecutive European ice dance title with first place in the opening rhythm dance on Friday. 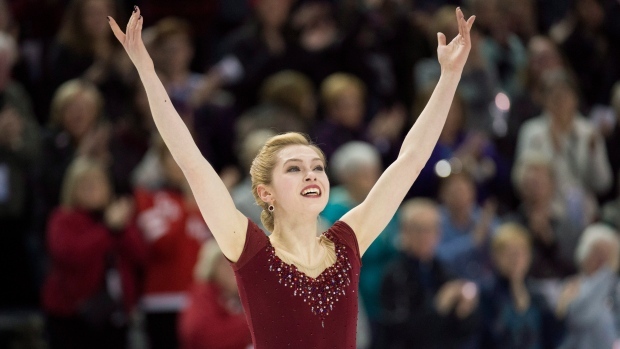 Catch all the action at the Canadian Tire National Skating Championships from Saint John, New Brunswick on TSN and CTV.